I love the image of weaving. It describes exactly the process of recording this album. Starting with a vague idea and the sonority of the lyrics, I found my musical sensitivity seduced into unknown and surprising places. The music gradually revealed itself – like a thread that winds its way, turning left and right, joining other threads, to eventually create a mystical carpet of sacred sound. On my journey I learned to listen to the empty space inside which is receptive to the music that flows from my heart. I hope that this spaciousness shines through and helps you, the listener, to fall in tune with yourself and your surroundings. Heartfelt and silky vocals intervoven with elegant instrumental arrangements create a mystical and soothing atmosphere. Cello, flutes, guitar, vocals, dilruba and soft drums give the album a very acoustic and warm feel. Punam Verville, a singer and pianist, contributed her beautiful voice to this album. 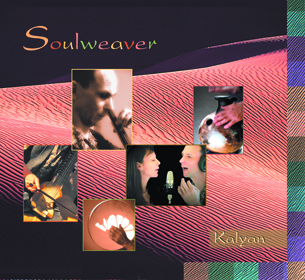 Soulweaver won the 2006 Visionary Award for best New Age CD in the USA. Published by Malimba Records. Buy from Malimba Records or itunes. We love it. Very good work. We feel you captured a mystical space and it creates a very deep space in the room. Well done, brother! Your playing/singing and compositions are first class. Also, the recording quality is great – you did your homework. J’ai écouté ‘Soulweaver’ (quel beau titre!) plusieurs fois et c’est une excellente musique, très inspirante, presque hypnotique. En tous cas Soulweaver est une méditation active très originale. Un CD que je vais réécouter souvent et faire découvrir à plein de gens car j’en connais beaucoup qui recherchent exactement ce genre d’approche musicale.